If you are visiting Bordeaux, don’t miss the Marche des Quais, the once-a-week outdoor Sunday market on the left bank of the Garonne River. Our “Chateaux, Rivers & Wines” cruise on Viking River Cruises’ Forseti embarked from Bordeaux, France. Although the itinerary for our first two days visiting this port city was jam-packed with excursions, one of the crew urged us to wake up early on Sunday morning to visit the Marche des Quai. As market lovers, even though totally jet-lagged, we couldn’t resist. As part of a broader effort to beautify a city whose porous limestone buildings had turned dingy gray from pollution, the entire waterfront area has been revamped. Indeed, the city once nicknamed “Sleeping Beauty” has re-awakened. Now recognized as a model of 18th century urban design and architecture, Bordeaux was designated a UNESCO World Heritage Site in 2007. It boasts more protected buildings than any other city in France besides Paris. Creating a welcoming and pedestrian-friendly river walk was part of this highly successful urban renewal effort. The river walk offers breathtaking views of the right bank of the Garonne. On weekends especially, the path is filled with walkers, runners and joggers; young couples pushing strollers; adult cyclists and toddlers learning to ride a tricycle; and older couples strolling arm-in-arm, soaking in the sun and fresh air. The quay also houses a vibrant roller skate park. Semi-enclosed behind graffiti walls, children and teens on skates, skateboards and scooters leap off ramps and jumps. Like any proper market, this one is frequented predominantly by locals. Regulars come with shopping carts to select fresh vegetables, fruits, cheese, meats, fish and seafood and regional delicacies (like mushrooms and truffles) to prepare at home from some 60 different vendors. Locals and tourists alike succumb on the spot to the wafting smells of the stalls and food trucks with baked goods and cooked foods served sizzling hot. We made the mistake of arriving right after a full breakfast onboard. Yet we couldn’t resist sampling several types of freshly-baked caneles from one of the pastry stands and from a free-standing cart that exclusively sells the branded Canelés Baillardran (in red boxes with multiples of 8) that are ubiquitous throughout the city (as well as at the Bordeaux airport). A specialty of the Bordeaux region, these small pastries have a soft inside and caramelized outside, flavored with rum or vanilla. They come in a variety of sizes, making them suitable for breakfast, a snack or dessert. Made with egg yolks, sugar, milk and flour, they are baked in fluted copper molds. Tradition says these sweets were first baked by winemakers in the monasteries who had an excess of egg yolks after using the whites to purify wine. Other stands offered tastings of “Gruff,” new wine (Vin Nouveau – not to be confused with Beaujolais Nouveau) made of grapes that have just been harvested and allowed to ferment in the bottle. If you have the time, be sure to order a plate of fresh oysters with a glass of white wine from the stand with tables and chairs closest to the skate park. Quai des Marques is located close to Marches des Quai (note the similarity in names, perhaps designed to confuse non-French speaking tourists) At the former, abandoned warehouses have been transformed into 33 eco-friendly modern shops and 13 restaurants, many with patios offering outdoor seating. The shops also include factory outlets. We were fortunate to visit Bordeaux during the fourth weekend of October, when dealers set up stands only blocks away in the same Chartrons neighborhood to host a new wine festival and flea market (Fete du Vin Nouveau & De La Brocante). For runners, the city has marked a 4.3-mile course around both banks of the river and past two bridges (Le Pont Chaban Deimas and Le Pont de Pierre (the highest lift bridge in Europe). If you arrive in Bordeaux on a riverboat, the Marche des Quai is located adjacent to the skate park, only a short walk from your vessel. If you are staying in the city, it is easily accessible (just across the street) from the Chartrons stop on the B tram. Go early in the morning to avoid crowds and to get a seat at the oyster cafe. Do not eat before you go. Repeat: Do not eat before you go. As in most crowded places, watch your pockets. On the river walk, pay attention to the bike lane that seems to have the right-of-way over pedestrians. Disclosure: Although our Viking River Cruise was sponsored, this was an independent shore excursion. Any opinions expressed in this post are our own. I absolutely love visiting local markets when I travel. Not only is it a feast for the eyes (and palate! ), it gives me a look into what really goes in “real life.” This market looks and sounds fabulous. French markets, like this one, are especially wonderful! The pictures are exactly how I visualized these local markets when I read “French Kids Eat Everything!” I like oysters but couldn’t stomach them for breakfast, but bring on the fresh croissants! I usually preferred my oysters fried but when they are extremely fresh, they are delicious doused with lemon! Its Sunday morning as I read this. Wish I was there. This is our favorite place to go on Sundays in Bordeaux. A plate of freshly shucked oysters is obligatory! What is it about French markets that are so intoxicating? We haven’t been to Bordeaux, but we’d love to. 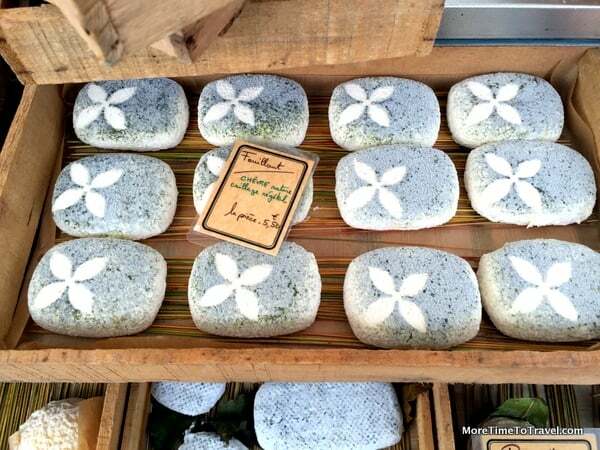 We spent 10 days in Aix en Provence in late May of this year and the markets were to die for. We probably went to the market at least 8 of our 10 days and the other 2 were only because we were off exploring. French markets are such a part of daily life, it’s a wonderful way to shop/eat. It’s so nice to be able to purchase food direct from the farmers/producers! I love markets like this. It looks as if Marche des Quais has a lot to offer. The cheeses and oysters would certainly attract me. I’ve never had caneles, but they sound delicious. You’ve got to love a market where there’s a fresh oyster bar with white wine! The marche des quai sounds like a must-visit when in Bordeaux. Those Caneles of Bordeaux sound incredible too – vanilla or rum – two of my fave flavours. It would be tough to choose. If anything could revive me from jet lag it would be a local market and this one is filled with so many goodies. Just imagine the time it took the cheese maker to cover the rinds with ash ? and a lovely leaf design. So much care, you can tell from your eyes it’s going to be tasty! I haven’t been to Bordeaux yet, but when I get there, i’ll make sure it’s on market day. All the products seem to have been grown or prepared with lots of love! I love visiting local markets like this, they are so colorful and fun to shop for something unique while savoring some great food. Marche des Quai looks wonderful- all that great produce- and oh the baked goods. I’m a big fan of both macaroon and canales. Made my mouth water! If you like macarons and caneles, you must visit Bordeaux—home of both confections! I love local markets and when in France I am especially happy. Repeat: Do not eat ahead of time! The colors are so vibrant and the organic produce is lovingly stacked in an art form. Loved the photos. Have not been to Bordeaux yet, but maybe one day. Bordeaux has been on my must-visit list for some time, and learning a little about the Marche des Quai makes me want to make that trek sooner rather than later…The prospect of oysters, caneles and those gorgeous cheeses is truly mouthwatering! It’s a great with wonderful architecture as well. I never pass up on a chance to visit a market. Your food photos scream FRESH! I’d love to try those caneles. Just the photo makes me drool. I’m on a local search for Caneles right now! I love outdoor markets. As for those pastries in Bordeaux’s Marche des Quai… I’ll take one of each, please!